Although the RCMP and Wet’suwet’en peoples have reached an alleged tentative truce, the fight over traditional land is still underway. On January 10, the two groups reached an agreement that the Wet’suwet’en people would allow Coastal GasLink employees access to the bridge previously blocked by the Unist’ot’en camp. In return, the RCMP would leave the other anti-pipeline camps within the area intact. That being said, it seems that the RCMP has violated the agreement struck with the hereditary chiefs. There have been reports from the Unist’ot’en camp that the RCMP has set up more camps leading up to the Gidimt’en checkpoint. In a phone interview with the Other Press, Jakub Burkowicz, a sociologist who teaches at Douglas College, shared his thoughts on the conflict and how it compares to how past groups have tried to reclaim their authority. Burkowicz also said that it is important to pay attention to who is allowed to enter the territory and who is not. Protests have continued to spark up worldwide, with people continuing to march in Vancouver and Victoria in solidarity with the hereditary chiefs. On January 9, protesters marching in Ottawa interrupted a scheduled speech by Justin Trudeau. On January 16, a group of supporters blockaded the Venables Street rail line in Vancouver along with vehicle routes downtown. Police responded to the scenes. The Venables Street group of protestors first marched from Grandview Park to the rail line and made a point of stopping outside of Advanced Education Minister Melanie Mark’s constituency office. 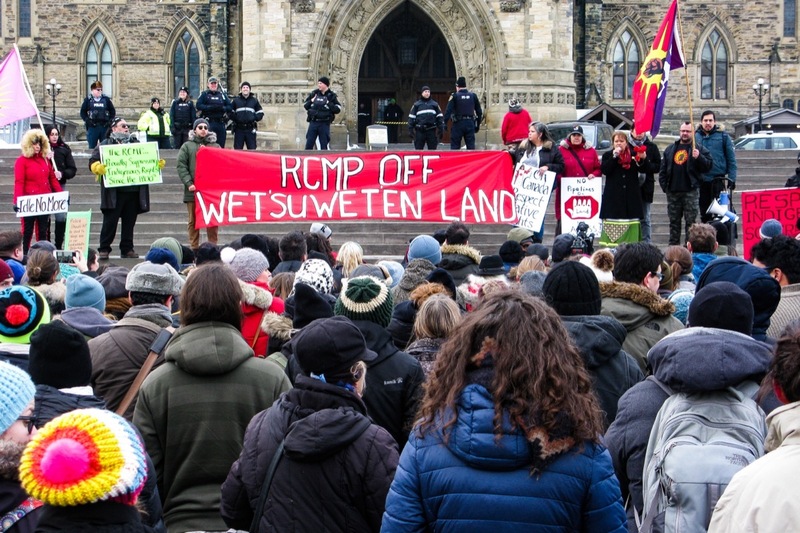 The group was comprised of Wet’suwet’en peoples, allied Indigenous peoples, and non-Indigenous supporters. The protests took a similar approach to the angle Audrey Siegl laid out in her speech during the first Coastal GasLink protest that happened in Vancouver. Siegl had said on January 8 that “Canada won’t start listening until it starts costing them.” It appears the protestors blockaded the rail line as a way to make Canada listen. Burkowicz, who focuses on social movements he teaches at Douglas, said that this protest shares some characteristics with other movements in history but is also uniquely Indigenous. He also said that, despite media reports that the RCMP and the hereditary chiefs have reached an agreement, that is not the full story. The court injunction that was passed in December will continue to be in place until those defending Wet’suwet’en land file a response in court at the end of the month.